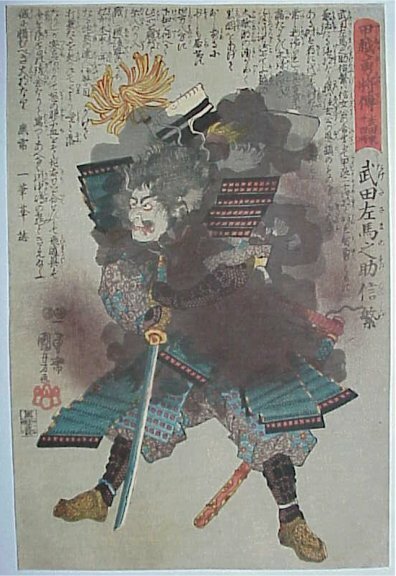 Iga Heinaizaeimon Ienage (Kumogakure Hōshi) is said to be the founder of Iga ryū ninpō, this flow was brought together by Toda Sagenta Nobufusa and thereafter transmitted to the Toda family. 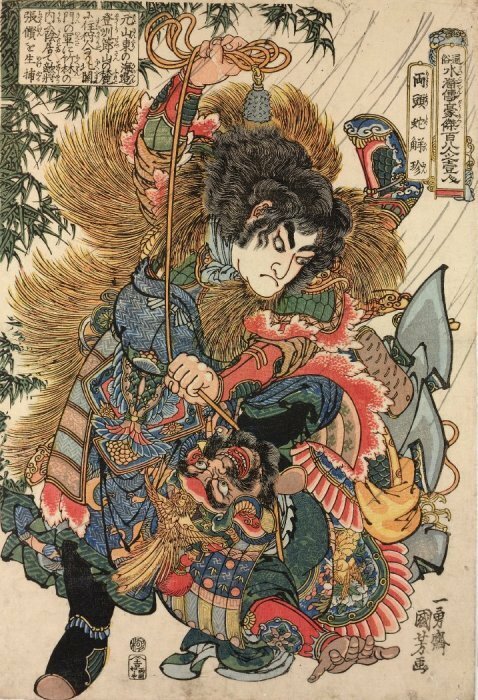 Another descendant of Hachidō Nyūdō’s Gyokko ryū, Kumogakure ryū is seen as the creation of Toda Sagenta Nobufusa based on the Iga ryū of Iga Heinaizaeimon Ienage. 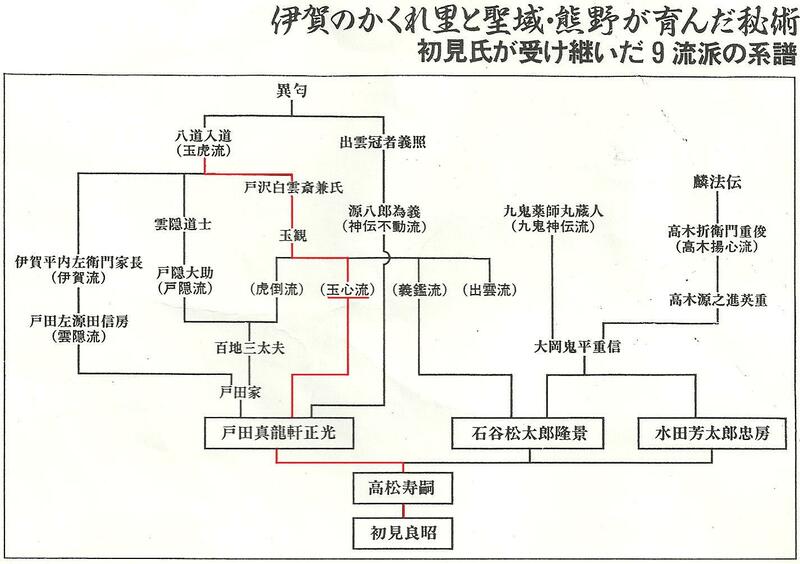 Through the Toda family it then finds its way to Takamatsu Toshitusgu and Hatsumi Masaaki. Iga Heinaizaeimon Ienage – looking at this name you can see ‘the patriarch of the family that resided in the peaceful house to the the left of the gate in Iga’ and so indicates a person of prominent position. He is also referred to as Kumogakure Hōshi, or a Buddhist priest hidden in the clouds, as noted with Togakure ryū this links the person with the nature of the Iga region and mountain asceticism. So is the style named by Toda Sagenta Nobufusa (the trusted follower) as Kumogakure ryū the taking of his teachers name or named after the location associated with the person? 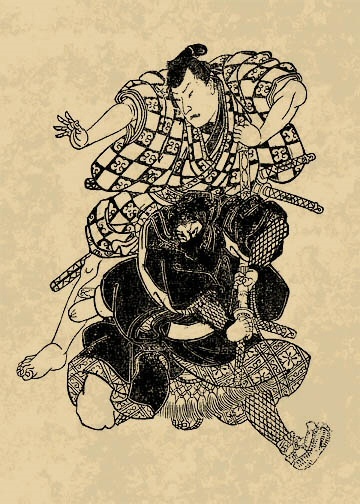 The description for Kumogakure ryū is brief and the same is true for the two following styles, Gyokushin ryū and Gikan ryū. To reiterate my purpose here is just to present a translation of the text and some comments on the names/kanji, I am trying to avoid any interpretation, explanation or information based on my experience of training with Soke or the Shihan in Japan (though I had to remind myself not to add a load on Kotō ryū from Senō-sensei last time…). 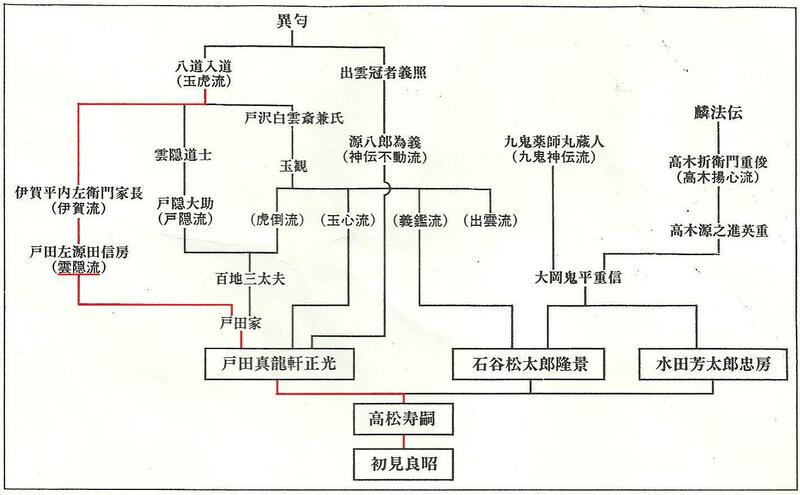 Drawing from the transmission of kosshijutsu, Sasaki Ōrōemon Teruyori is the founder. A speciality of the ninpō schools is their weapon of choice, for Gyokushin ryū this is the nagenawa. 玉心 Gyokushin – jeweled heart, treasured spirit, precious centre or core, to treasure that held in the heart – all interchangeable and viable interpretations. Jeweled heart is the most frequently quoted, but doesn’t really do justice to the name as is a simplistic reading of individual kanji. 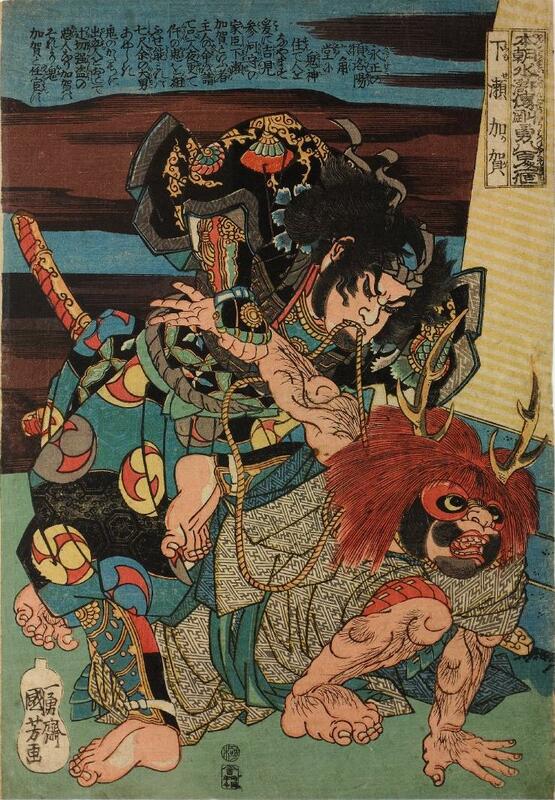 暉頼 Teruyori – shining trust – also written as Akiyari and Teruyoshi in various translations. 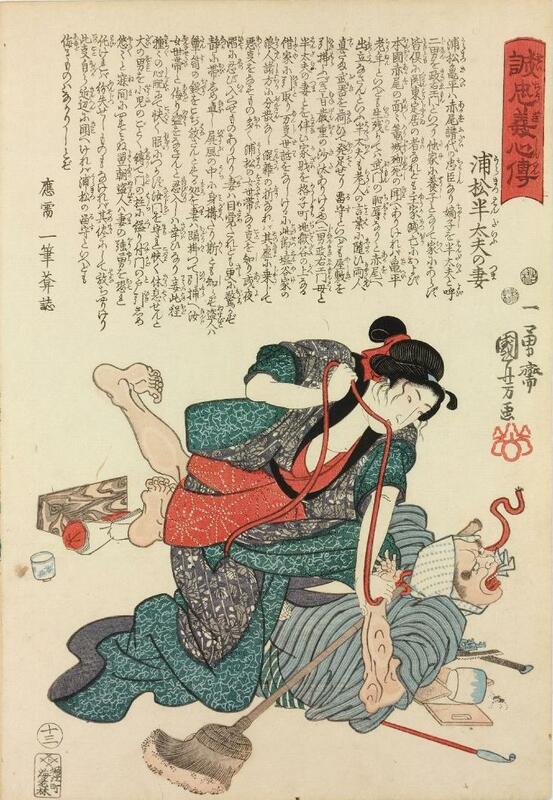 投縄 Nagenawa – throwing rope or lasso – though I dislike the use of lasso as this translation often brings to mind the American cowboy – possible better functional terms are looped rope, catching rope, thrown rope, snare or restraining rope. 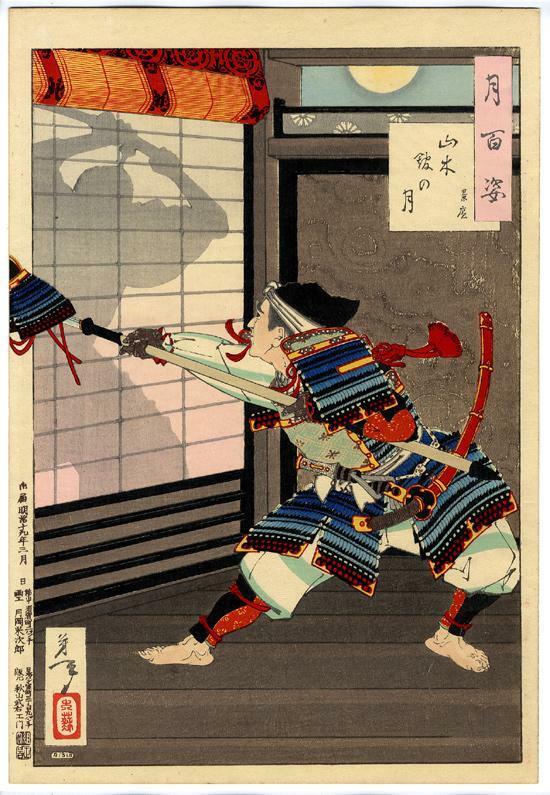 Gyokushin ryū is one of the 4 styles attributed to Gyokkan, who learnt the Gyokko ryū ofHachidō Nyūdō through Tozawa Hyakuunsai Kaneuji. 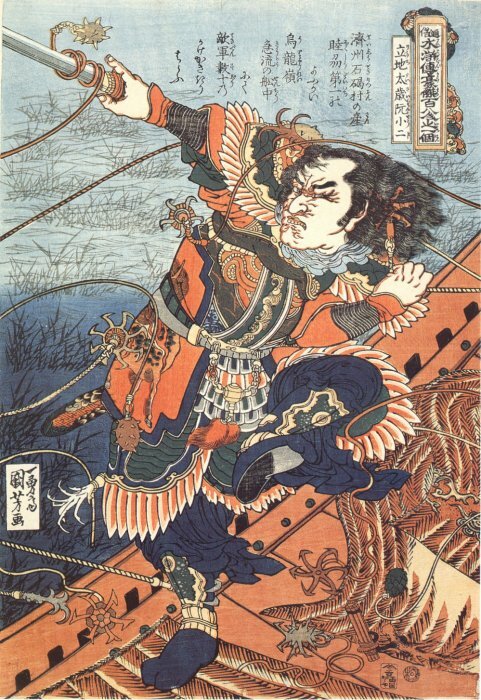 Gyokushin ryū is passed down to Toda Shinryūken Masamitsu and Takamatsu Toshitsugu to arrive at Hatsumi Masaaki.